BackgroundYersinia pestis is a contributing agent to the epidemic disease, plague, which killed an estimated 200 million people during historical times. In this study, a rapid, cheap, sensitive, and specific technique, the lateral flow assay (F1 strips), has been successfully developed to detect this pathogen, by using paired monoclonal antibodies (MAbs) against Y. pestis capsule like fraction 1 (F1) protein. Compared with the polyclonal antibody (PAb) based F1 strips, the Mab-based F1 strips have a remarkable increased detection limitation (10 to 100 folds). Furthermore, besides the limitation and specificity evaluation, the application of this F1 strip on simulated clinical samples indicate the LFA can be a good candidate to detect plague.MethodsRecombinant F1 antigen was expressed and purified from a series of works. The various anti-F1 monoclonal antibodies generated from hybridoma cells were screened with the ELISA technique. To evaluate the feasibility of this Y. pestis F1 test strip, the F1 protein/Y. pestis was spiked into simulated clinical samples such as human serum, mouse bronchoalveolar lavage fluids, and mouse blood to mimic natural infection status. Additionally, this technique was applied to detect the Y. pestis in the environment-captured rats, to evaluate the practical usefulness of the strips.ResultsBy using this MAb-based-LFA technique, 4 ng/ml of recombinant F1-protein and 103 CFU/ml of Y. pestis could be detected in less than 10 mins, which is at least 10-folds than that of the PAb format. 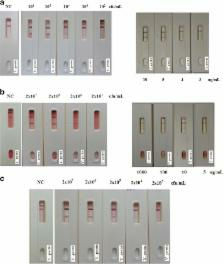 On the other hand, although various Yersinia strains were applied to the strips, only Y. pestis strain showed a positive result; all other Yersinia species did not produce a positive signal, indicating the high efficiency and specificity of the MAb-based F1-strips.ConclusionBased on our findings, we suggest that the MAb-format-LFA will be valuable as a diagnostic tool for the detection of Y. pestis. This report shows that the F1 strip is sufficient to support not only the detection of plague in simulated clinical samples, but also it may be a good candidate to meet the epidemiological surveillance during an outbreak of the biological warfare. Yersinia pestis--etiologic agent of plague. Plague is a widespread zoonotic disease that is caused by Yersinia pestis and has had devastating effects on the human population throughout history. Disappearance of the disease is unlikely due to the wide range of mammalian hosts and their attendant fleas. The flea/rodent life cycle of Y. pestis, a gram-negative obligate pathogen, exposes it to very different environmental conditions and has resulted in some novel traits facilitating transmission and infection. Studies characterizing virulence determinants of Y. pestis have identified novel mechanisms for overcoming host defenses. Regulatory systems controlling the expression of some of these virulence factors have proven quite complex. These areas of research have provide new insights into the host-parasite relationship. This review will update our present understanding of the history, etiology, epidemiology, clinical aspects, and public health issues of plague. Natural history of plague: perspectives from more than a century of research. For more than a century, scientists have investigated the natural history of plague, a highly fatal disease caused by infection with the gram-negative bacterium Yersinia pestis. Among their most important discoveries were the zoonotic nature of the disease and that plague exists in natural cycles involving transmission between rodent hosts and flea vectors. Other significant findings include those on the evolution of Y. pestis; geographic variation among plague strains; the dynamics and maintenance of transmission cycles; mechanisms by which fleas transmit Y. pestis; resistance and susceptibility among plague hosts; the structure and typology of natural foci; and how landscape features influence the focality, maintenance, and spread of the disease. The knowledge gained from these studies is essential for the development of effective prevention and control strategies. Comparative analysis of biofilm formation by main and nonmain subspecies Yersinia pestis strains. PCR detection of Yersinia pestis in fleas: comparison with mouse inoculation. Plague (Yersinia pestis) in cats: description of experimentally induced disease.